Where to find inexpensive plus sized bridesmaid dresses up to size 26 and in 28 different colors. If some of your bridesmaids are large curvy girls, you may be wondering where on earth to find affordable plus size bridal gowns. Well the good news is that I've found a great high quality wholesale wedding dress supplier that makes simply gorgeous gowns in larger sizes up to size 26. And that size will fit a 53" bust, 47.5" waist and 55.5" hips. So if you want, you can choose the same styles for all your attendants or a different style for the larger girls and STILL have a perfect color match, provided all the dresses are made from the same fabric. I've picked out a few of my favorite plus sized bridesmaid dresses available in up to 28 different colors and all up to size 26. If you don't find something you like here, just take a look at the entire bridesmaid dresses collection instead, all available in plus sizes. Remember that the most flattering shapes for larger girls with curves are A-line shapes, v-necks or, for the more daring, tight corset style dresses that really flaunt those curves! A flattering A-line shape for all your bridesmaids. 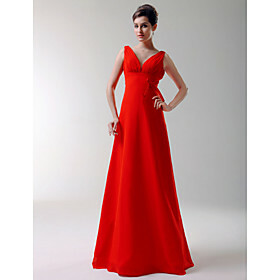 This simple V-neck dress has a lovely criss-cross bodice to highlight the bust and floaty chiffon skirt. At under $80, this dress is affordable for a large group of attendants. Strapless Empire-line Bridesmaid Dress - Perfect for larger or pregnant ladies! The simple empire-line styling on this satin, ruched bodice dress suits all shapes, but esepcially larger ladies. The chiffon fabric on the skirt drapes beautifully to flatter your shape. Flattering long V-neck dress with side draping and bow detail at waist, perfect for larger ladies due to its A-line shape. The Grecian style ruched bodice drapes gently over the bust. Dress made from elastic chiffon satin. Tip: If you're at all worried about ordering plus sized bridesmaid dresses online, why not order one dress first, just as one of the reviewers did. That way you can be sure of the quality and fit before you order a whole batch!